Smart Fortwo Performance, Engine, Ride, Handling | What Car? 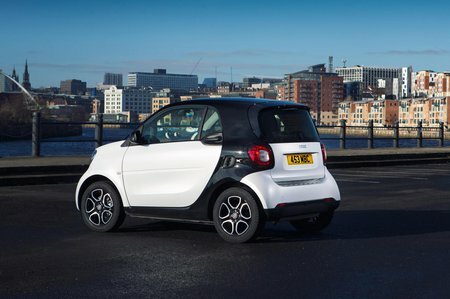 Smart offers both petrol and all-electric versions of its Fortwo, much like its predecessor. The five-speed manual gearbox is the best choice, because while the dual-clutch auto swaps through gears reasonably smoothly and works well with the surprisingly willing little three-cylinder engine, it’s pretty jerky in stop-start traffic. The 89bhp 0.9-litre has enough low-down pull and outright power to propel a couple of adults with luggage across undulating, hilly terrain or motorways with ease. The 107bhp Brabus version adds a little more poke, but you wouldn’t describe it as quick. Meanwhile, the least powerful 70bhp engine hasn’t got much low-down oomph so struggles on faster roads, but copes easily in city traffic - and this is a city car after all. Handling wise, the Fortwo is less impressive. Its steering is vague off centre and it never really weights up enough to deliver confidence in what the front wheels are up to during quicker cornering. 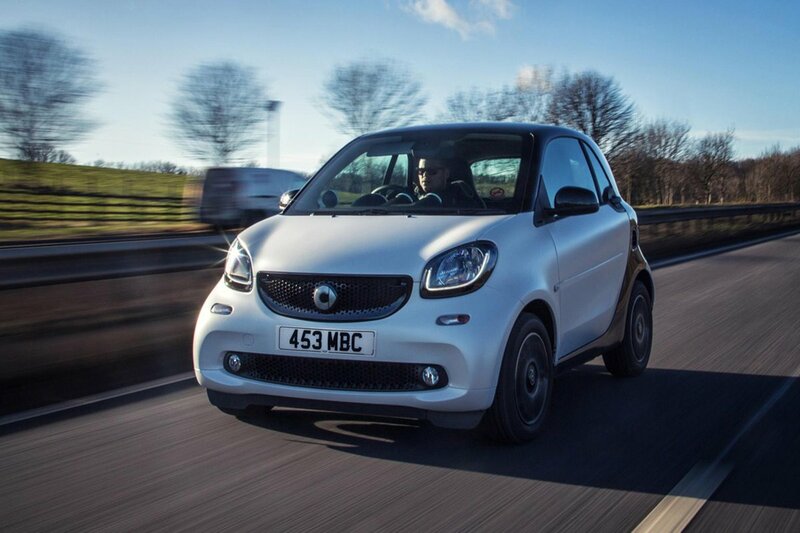 Coupled with the Fortwo’s tiny wheelbase, this creates a disconcerting nervousness when turning into bends or trying to maintain a steady line on the motorway. There’s also noticeable body lean in tight corners, and even the versions with stiffer suspension, such as the Sport Prime and Brabus, don’t feel much better tied down. Perhaps more importantly for a city car, the Fortwo is superb at scooting through cramped, twisting urban streets. That quick steering works far better at low speeds when darting through traffic, and its class-leading turning circle of less than seven metres allows for U-turns and parking manoeuvres that are scarcely believable. However, it’s never a very comfortable experience. The Fortwo bucks and heaves over cracks and potholes that you’d barely register in other city cars, such as the smoother-riding VW Up. If you’re still hooked on Smart ownership stick to models without stiffer sports suspension, which only exacerbates its shortcomings. Under load, the petrol engines – which are sat only a few centimetres behind you - whir away noisily. At a steady 70mph cruise their thrum settles a bit, but then the shrill wind and road noise become the primary nuisance. The Fortwo Electric Drive is the cream of the crop on the road. Its 80bhp electric motor, juiced-up by a 17.6kWh battery, is quiet, smooth and effortless. And the instant hit of torque from the electric motor the minute you put your foot down makes it feel much quicker than its 0-62mph time of 11.5secs suggests. The handling is a little better, too, thanks to a lower centre of gravity gained from having the battery under the seats, meaning you don’t get quite the same alarming lean angles through corners as the petrol versions. The range of the electric version is limited though; it offers a claimed 100 miles from fully charged, which in the real world this will be closer to 60-75 miles; even less if you’re doing a constant 70mph on the motorway.